Otto Piene, the eighty-four-year-old German artist who founded the collective ZERO and is revered for his series of works called “Light Ballet,” recently spoke about his career in a conversation at the New Museum (he is currently part of our group exhibition, “Ghosts in the Machine”). During the talk, he cited one of his philosophy teachers who propagated that there is a physiological phenomenon when we leave a musical concert—we are often in a state of being refreshed and illuminated. 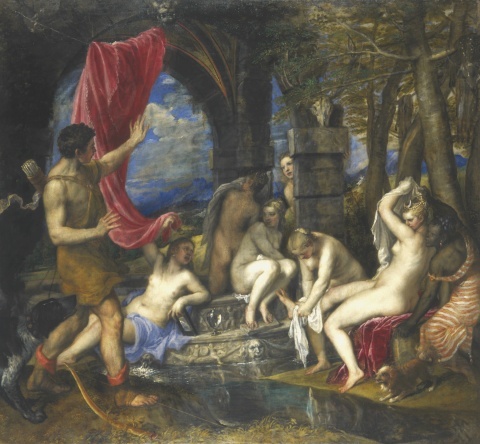 The premise: bring together the homegrown talent of composers, choreographers, dancers, and artists, give them two years and a healthy budget, and ask them to make new ballets inspired by three Titian paintings, all based on the myth of Diana and Actaeon (and on display in the National Gallery). When the curtains lifted on the first of the three ballets, we were presented with a minimal set—a light source moving erratically behind a screen and two dancers. As the ballet advanced, the screen rose to reveal a second translucent one as well as startling Prometheus-like shadows of a gigantic three-legged machine. The light source was attached to an armature vaguely reminiscent of a horse’s head—think double-jointed elbow swinging aggressively in all directions. In the last movement, the screen rose to expose the machine in all its glory, becoming a counterpart to the dancers, a player on the stage. This is risky set design—a type of animation that could overwhelm the dancers—but the machine’s inventor, London-born-and-bred Conrad Shawcross, strikes the balance perfectly, causing my mind to go into overdrive, excited by the future possibilities of another kind of light ballet. 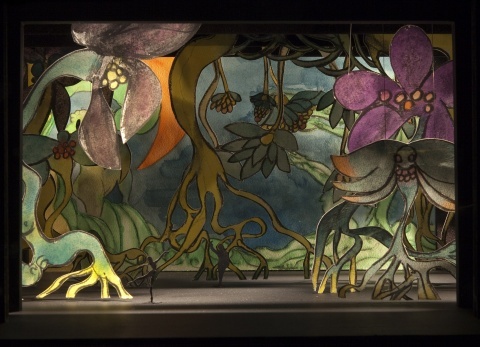 Shawcross’s nervy execution is bookended by the finale ballet designed by Chris Ofili. When the curtains parted, it was the opposite of minimal—lush, colorful, extravagant, sensual. An audible gasp prevailed as we were treated to a visual feast of fauna and female nudes, painted by the artist at a daunting scale. This ballet felt the most cohesive (largely because of the choreography team’s narrative approach) and as the story progressed, various layers of the set rose up and disappeared. It’s clear that Ofili immersed himself in ballet culture—his costume designs rivaled the classics such as Stravinsky’s Firebird or Tchaikovsky’s Swan Lake, and harkened back to his regal portraits of women. When I walked out to the dreary, rain-soaked pavement, I was in a state of glee and envy. Here were three major institutions, collaborating across platforms with complex teams, and producing astounding new work. Lincoln Center or Park Avenue Armory, I hope you are reading this, please bring these ballets to New York City.